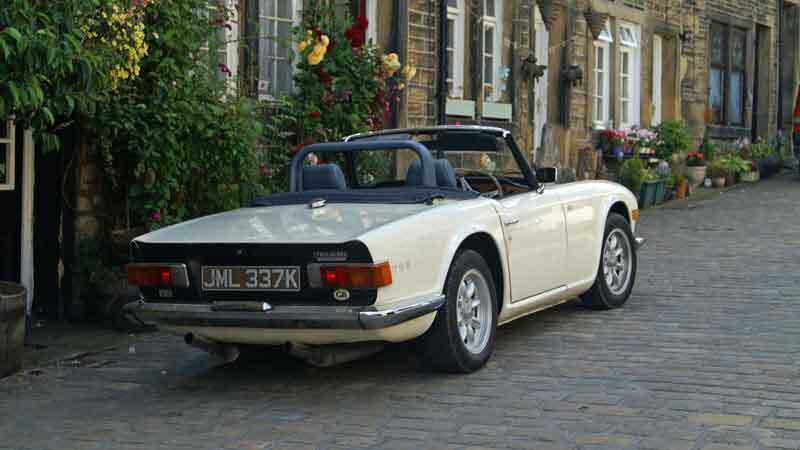 Why hire a Triumph TR6? 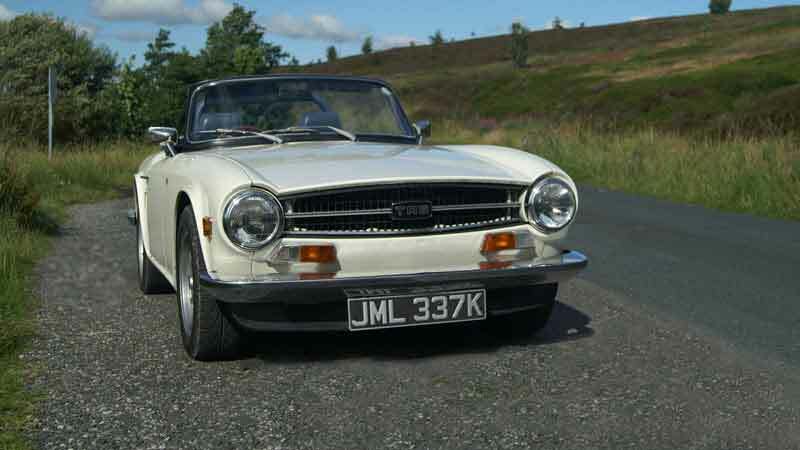 This TR6 is probably the coolest convertible sports car of its era on the roads of Yorkshire. There are many faster cars but few have the character of a nice Triumph. 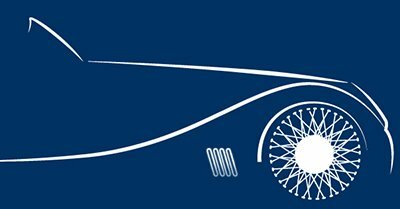 This is particularly true of ours, which has a splendid antique white finish, shadow blue leather interior and blue hood. 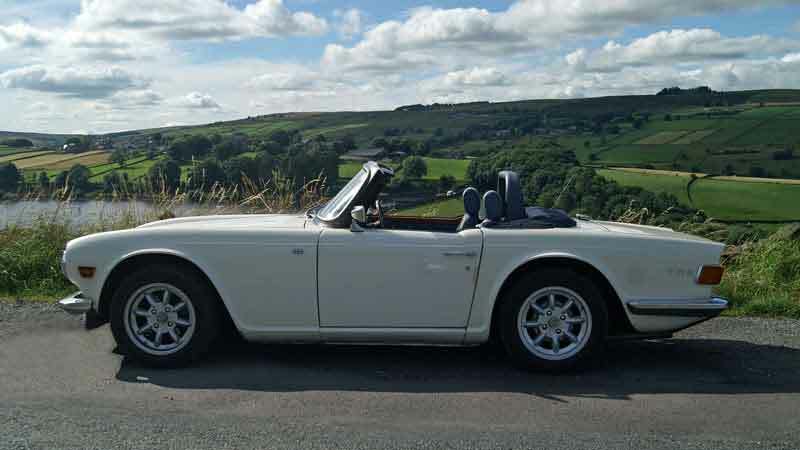 A Triumph TR6 hire gives you the opportunity to experience this great British sports car dubbed by James May as “the blokiest bloke’s car ever built!” Cruise around country lanes in the Yorkshire Dales or Lake District with the roof down. You’ll have a great time and come back smiling. 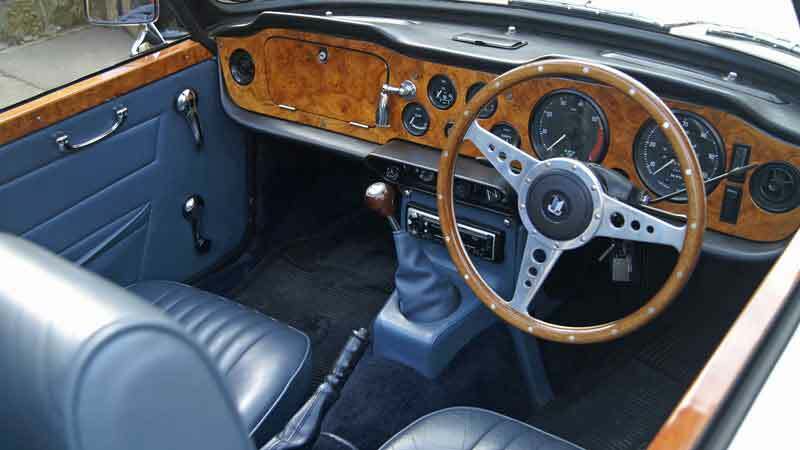 With its fabulous blue interior with burr walnut trim it also makes a gorgeous wedding sports car. With it’s chiselled styling and 150bhp grunt, the TR6 has just the right amount of sophisticated muscle. Its squared off front fascia and sharp black painted tail make it an attractive, masculine looking sports car. The performance and handling is also excellent for a 1970’s vintage roadster. Its a very enjoyable two-seater to drive. 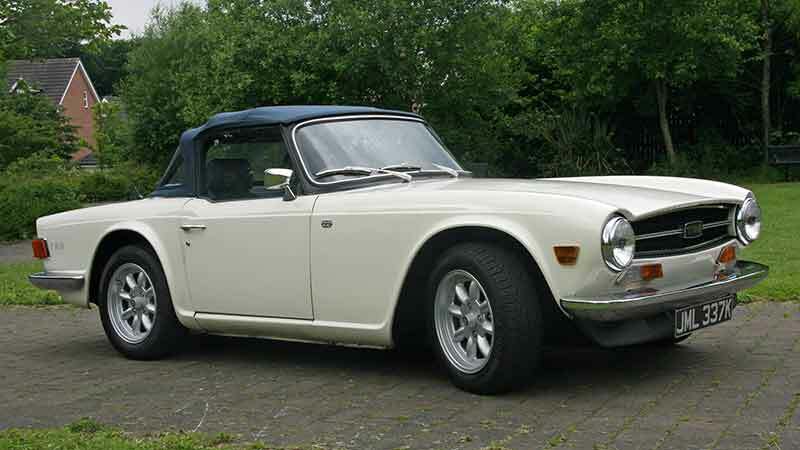 Our 1971 Triumph TR6 is powered by a 6 cylinder 2.5 litre fuel injected engine, and was one of the most sophisticated sports cars of its time. Technology has moved on since the TR6 was built, but because of its advanced design at the time, it’s still on a par with modern sports cars and would give the average MGF or MX5 a run for its money. The difference is that the TR6 is just a bit more special and exclusive. The other difference is that the TR6 has a six cylinder engine. That may not sound much of an advantage, but it makes the whole power delivery much smoother and it just feels a whole lot better than a car with four cylinders. The gearbox is very positive and sports car like, again reflecting the era. It all adds up to incredible fun. To get a view of what it is like to drive a Triumph TR6 read this review and watch this video produced by Matt Nichols of Classic Cars Driven. Good size boot for a 2 seater, big enough for a medium suitcase and small bag.